« What’s the Best Way of Boosting Tax Compliance, Lower Tax Rates or More Oppressive Enforcement? Which is the point I made in interviews with Judge Napolitano and John Stossel. P.S. 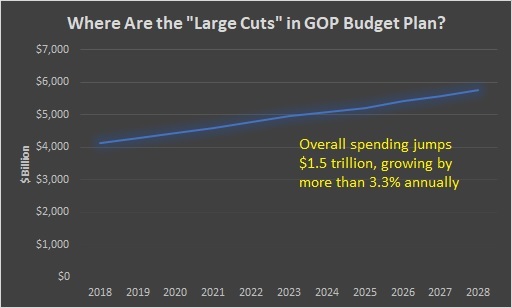 The House GOP budget certainly is better than the status quo, especially since it assumes genuine reform of Medicaid and Medicare. But I prefer Rand Paul’s budget, which actually cuts spending in the first year (gasp!) and then limits spending in subsequent years so it grows by 1 percent annually. P.P.S. For those who think modest spending restraint is impossible, don’t forget that we actually had a de facto five-year nominal spending freeze during the Obama years. P.P.P.S. Here’s a previous example of budget inaccuracy in the Washington Post. What’s up,I read your blog named “Dishonest and Deceptive Budget Analysis from the Washington Post | International Liberty regularly.Your writing style is awesome, keep doing what you’re doing! And you can look our website about ظ…ظ„طھظٹ ظ…ط§ظƒط§ â€“ Multi-maca ظ…ظ†ط´ط· ط¬ظ†ط³ظٹ ط·ط¨ظٹط¹ظٹ ظ„ظ„ط±ط¬ط§ظ„ ظˆط§ظ„ظ†ط³ط§ط،. I wouldn’t expect anything less from the Washington Compost. The ruling party always wants more spending. Except that Democrats want more spending even when they’re in the opposition. That is in a nutshell why the road to more spending is more open when republicans are in government.